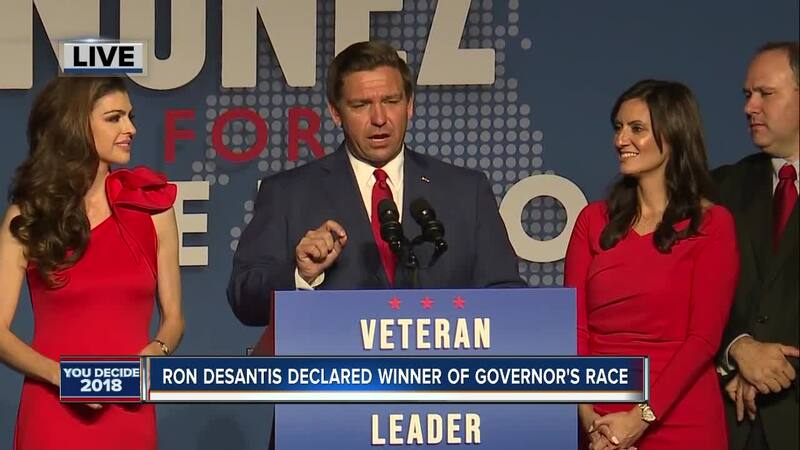 Ron DeSantis gives his victory speech to supporters in Orlando, Florida. 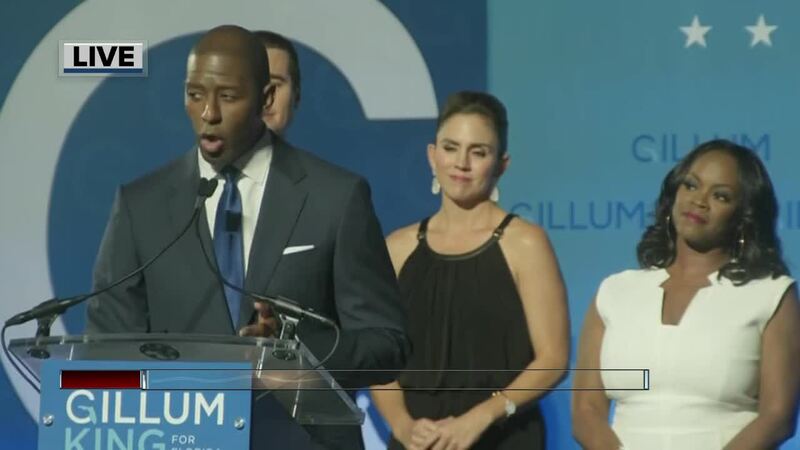 TALLAHASSEE, Fla. -- Andrew Gillum delivered his concession speech at his watch party in Tallahassee, Florida late Tuesday night. Ron DeSantis is now the governor-elect of Florida. Tuesday night's election results marked the end of one of the most closely-watched gubernatorial races in the country. Former congressman, Ron DeSantis, won the GOP primary thanks to the endorsement of President Donald Trump. He aligned his campaign goals with the ideas President Trump introduced in his 2016 campaign: a crack down on immigration and repealing and replacing the Affordable Care Act. Tallahassee Mayor, Andrew Gillum, was Florida's first black gubernatorial nominee. He had gotten the support of Senator Bernie Sanders and Former President Barack Obama. He pushed for Medicaid expansion and tighter gun laws. Gillum would have been the first Democrat elected to the Governor's office since 1998. Once elected, DeSantis or Gillum will hold Florida's highest executive office. He would be in charge of approving the state budget, running state law enforcement and spearhead any environmental regulations. The next Governor would also appoint the next three Florida Supreme Court justices. Those judges reached the Court's 70-year-old age limit. All three are also often part of a majority that's ruled against current Governor, Rick Scott, and the Republican-controlled legislature. Governor Scott thought he'd be able to appoint the new judges before he left office Jan. 8, but the Court had other plans. It ruled the newly elected Governor would have "sole authority" to fill those vacancies. So whoever gets elected tonight can dramatically affect the decisions that come out of Florida's Supreme Court.